This is definitely a protein boost recipe (see the posting on Soy beans). 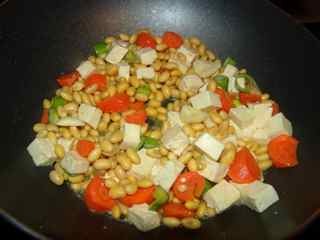 As I mentioned in a the previous posting, whenever we are having a vegetarian dinner I would always prepare a dish with soya in it (soya beans or tofu, for example), so this is one of them. I started cooking it all by chance. 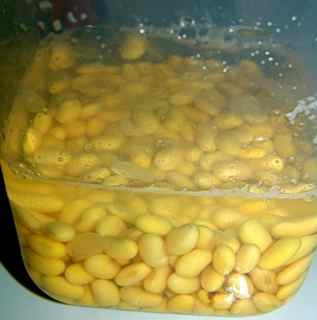 One night, I soaked some soy beans with intention of making soya milk, but I completely forgot about it in the next morning, only realized at dinner time, and thought it had got to be cooked soon. So this recipe popped to my head. I don’t think I created this recipe, somewhere in the deep deep of my memory, I had it before, probably cooked by my auntie, but… I couldn’t confirm with her anymore…. Anyway I made this with a traditional stir fry method, and it turned out to be a really good one. I don’t know the name, let’s just call it ‘stir fry soya beans’ then. Stir frying soya beans at home is actually not uncommon in the Northeast of China. The soil there is very good for growing great soya beans, and the locals often try different methods of making it. I bet if I could ask my grandma or my auntie, they could tell you about many soya bean dishes. Here you go how I made it. Soya beans,(you can get them in most of the Chinese supermarkets, and lately, you can get them in Tesco. In some supermarkets like Co-op, or Holland & barrett, they sell a pack of mixed beans, it is great alternative especially if you forgot to soak soybeans). Tofu, carrot, garlic, spring onion, oil, cooking wine (optional), salt, light soy sauce (optional), ground sichuan peppercorn (optional). —– (lots of ‘optionals’, but it is not necessary to use all of the ingredients, as the main contents themselves already created a good taste). 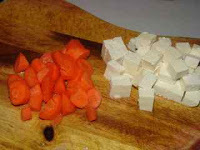 2) Slice a small piece of tofu and one carrot into little cubes. 3) Chop two cloves of garlic and half of a spring onion. 1) Place an inner dried wok on strong fire, and pour in 3-4 tablespoons of oil. 2) When the oil is hot, sprinkle around 1/3 teaspoon of ground sichuan peppercorn. 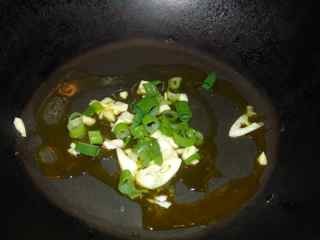 3) Then add chopped garlic and spring onion in the wok. 4) When the ingredients in the wok is well cooked — the fresh smell rising from the work, put the soybeans in, and stir well, turn down the fire to medium for ‘slower’ cooking the soybeans. 5) Stir-fry soybeans might take 3- 5 minutes at least, if it gets too dry in the wok, add in some water — but little by little as the dish is supposed to be dry without any sauce in the end. 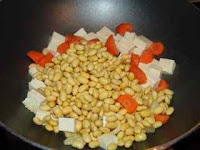 6) Then add in carrot cubes first, tofu last. 7) Add in a teaspoon of cooking wine and a drop of light soy sauce, a bit less than half teaspoon of salt (I have got to learn to how describe the measurement better:) Sorry for now). 8)Keep stir fry for a further 3 minutes or more, until carrot is cooked, and the seasonings go into the main ingredients. >I've got a box of tofu in the fridge for some two-months now and still haven't cooked it. If it's ok I'll cook it to this recipe! Cheers!